Storylandia 23, “Ariel Views,” by Fred Russell, now on sale! Posted on November 10, 2017 | Comments Off on Storylandia 23, “Ariel Views,” by Fred Russell, now on sale! Where to buy: Amazon (eligible for free shipping) and Kindle. Comments Off on Storylandia 23, “Ariel Views,” by Fred Russell, now on sale! I remember seeing commercials when this movie came out in 1980. The featured image was of an empty wheelchair chasing someone down through a house, which my friends and I thought very funny and not at all scary. This is a pity, since The Changeling is for the most part an effective, classic ghost story with a touch of post-Watergate conspiracy thrown in. The movie starts with a happy family. A husband and wife (George C. Scott and Jean Marsh, who once played that less-happy couple, Edward Fairfax Rochester and Bertha Mason) and their little girl are pushing a paneled station wagon up a snowy country road in upstate New York. In spite of the car’s breakdown in the middle of nowhere, everyone is laughing and joking. When they reach a turn-off with one of those large wooden signs indicating the entrance to a State Park, the husband crosses the road to a phone booth on the other side to call for assistance. The wife and daughter engage in a playful snowball fight between the car and the sign. After the success of Roger Corman’s cycle of films based on the works of Edgar Allen Poe, AIP naturally wanted to produce more like them, but they soon had to turn to other sources. There simply aren’t that many Poe short stories easily adapted to the screen, and fewer still that could be stretched into full-length movies. Once they’d used up their best candidates, including a comedic spoof in The Raven and an anthology of short stories in Tales of Terror, AIP turned to HP Lovecraft. In the early 1960s, Lovecraft hadn’t yet gained his fame, while Poe was well-known as America’s leading writer of the macabre, so they used the former writer’s story ideas, dressed up in trappings of the latter. Die, Monster, Die isn’t the earliest example, nor the best, but it’s on the flip-side of The Dunwich Horror and it’s got Boris Karloff in it in one of his last films. This Dark Shadows audio drama on CD picks up where The House of Despair leaves off: Quentin Collins has returned to Collinsport to find his family home haunted and abandoned, and his family mysteriously gone; he’s summoned up Angelique, who in turn has resurrected Barnabas Collins in a new body (to match his new voice). While this long-lived and supernatural trio are up at Collinwood trying to figure out what happened to the rest of the Collinses, Maggie Evans, now proprietor of the Collinsport Inn, looks after traumatized Willie Loomis. Willie had a rough time up at Collinwood due to his own part in driving out the evil entity that occupied the house. For one reason or another, it became necessary for the newly restored Barnabas to bite him again, so Willie’s back where he was as far as playing Renfield. Not that Maggie knows this. She’s forgotten that she ever knew Barnabas was a vampire, and certainly doesn’t know that he’s alive again. In spite of the not terribly descriptive title, this is an episode I’m fond of. It features one of those extremely low-budget invisible monsters–but it’s a interesting invisible monster, when the viewer does sort of see it. The episode begins with Carl Kolchak writing, and narrating, from a hospital bed, about the construction of Chicago’s new Lakefront Hospital. The dedication ceremony to open the place officially and show off the up-to-date medical equipment was a major press event, but once we go to flashback we see that Carl attends only grudgingly. This isn’t the kind of news story he’s interested in. He rejects the standard press packet–and is very condescending to the young woman who offers it to him (“That’s very good. You remembered that all by yourself?”)–and gets sulky when he misses the opportunity to get a drink before the hospital administrators make their speeches. Then the lights flicker; that rouses Carl’s curiosity. The building is brand new, so why is it having electrical problems already? A couple of weeks ago, I was staying in Providence, Rhode Island. Fall River, Massachusetts, is only about 10 miles away. Since I’d written a review of The Legend of Lizzie Borden this past spring and felt I was pretty well read up on the case, I had to go and see the site of the murders for myself. So on that Saturday morning, I took the short drive over to Fall River and located the Borden house on Second St. The house is about the only thing in the neighborhood that remains the same as it was in 1892. The neighboring homes of the Churchills, the Kellys, and the Bowens are long gone, replaced by new and larger buildings. I knew that the present owners ran the house as a bed and breakfast and also held tours on an hourly basis. I arrived too late for the first tour of the day and had to wait for next one. Tickets can be purchased inside the barn at the back–the barn where Lizzie Borden claimed she was eating pears and looking for lead for sinkers during the time her father was murdered. It’s now the gift shop. Young Willie runs away from his abusive life in rural Nebraska to join the Albey Brothers Traveling Circus. 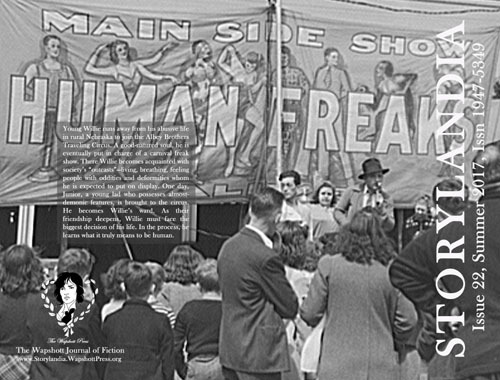 A good-natured soul, he is eventually put in charge of a carnival freak show. There Willie becomes acquainted with society’s “outcasts”—living, breathing, feeling people with oddities and deformities whom he is expected to put on display. One day, Junior, a young lad who possesses almost-demonic features, is brought to the circus. He becomes Willie’s ward. As their friendship deepens, Willie must face the biggest decision of his life. In the process, he learns what it truly means to be human. Robert Bloch was a teenager when he wrote a fan letter to author H.P. Lovecraft in the 1930s. It was the beginning of a friendship-in-correspondence that lasted through the rest of Lovecraft’s life and launched Bloch on his own writing career. This friendship also led Lovecraft to dedicate his last complete short story, The Haunter of the Dark, to Bloch, in response to a story young Bloch wrote about someone rather like him; the protagonist is named after Bloch, with his last name anglicized to Blake. Many years ago, a friend and I were driving to Atlanta for a library conference; our route took us across the northeastern corner of Alabama during a moonlit night. When we stopped for gas, she excitedly pointed out some nearby trees draped with what looked like straggling clumps of green-gray yarn that someone had attempted to knit into scarves then tossed over the branches when the results turned out badly, but were actually the outgrowths of a parasitical plant. That stuff would be Spanish moss, and it does look rather spooky in the right kind of dramatic light even on a tree… and even more so when it’s all over Richard Kiel. The Spanish Moss Murders sounds like the title for an Ellery Queen mystery novel, but it happens to be one of the best Kolchak episodes. It’s got a lot of humor, featuring a number of interesting and amusing characters in small roles, plus a monster that isn’t one of the commonplace vampires or werewolves.